Race To The Top: Hey, Kid! Listen Up! 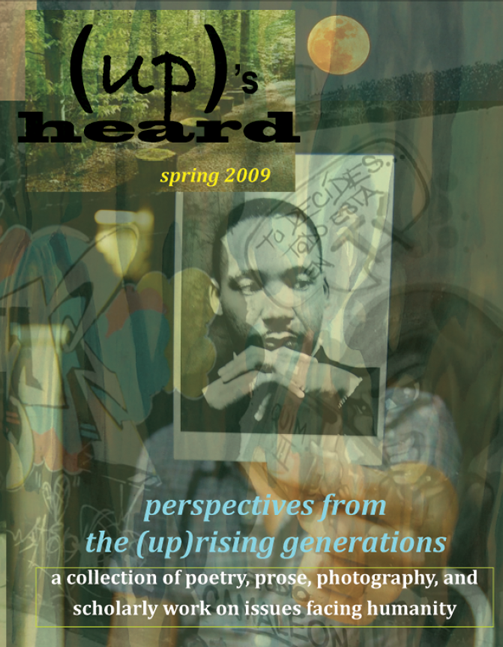 (up)’s heard is a project driven by our desire to give voice to the (up)rising generations. We are referring to today’s younger generations, of which these myriad voices are a part. We would love for you to understand why we seek to amplify these voices by understanding how we identify our role within history and conceptualize our collective identity. We are curious, constantly shifting and forever learning. We live fiercely and connectively through relationships. (up)rising involves collective action characterized by seeing, listen¬ing, understanding and engaging. We will ‘burn the candle at both ends’ for something we believe in. We choose the battles that connect with our hearts and passionately advocate for the world we want to live in. (up)risers raise hell when things need to happen! You will hear the echoes of many voices who believe the time is now and know that sometimes raising hell means putting pen to paper. We are sometimes angry and yet we are not jaded in the way that drains our vitality – we may scream in the streets, but we do so because we believe change is possible . We love this world enough to struggle to save it. We are not afraid of grand ideas because our minds are expansive enough to embrace them. (up)risers are danc¬ing on the edge of what is currently possible, knowing the world is at our fingertips and we can change it.